When venturing into Un’goro, be on your guard—the crater is home to huge dinosaurs, challenging Quests and primordial Elementals! Today we’re going to take a closer look at how Elementals were designed and what they do. When you play an Elemental, their latent energy sticks around and other Elementals can make use of it on the following turn. Many Elementals in Journey to Un’goro get a bonus effect if you played an Elemental on the previous turn. Elementals in your hand will light up with a unique glow when this bonus is active. Yes, we have definitely seen this guy reach 30 health. How did we come up with the Elemental mechanic? We want each minion type to have its own unique feel and gameplay. When working on the Blackrock Mountain adventure, we decided some cards should get a bonus while you’re holding a Dragon in your hand. This let Dragon decks focus on having large minions, and their mechanic mitigates the downside of holding onto an expensive Dragon while you wait to have enough mana. We knew we had to come up with something unique for Elemental decks that made them feel very different. During the initial design phase of a set, we explore a lot of ideas—even ones we know won’t work in the end—because iterating on those ideas helps us learn what kinds of things are fun. Maybe we try one mechanic that turns out to be bad, but along the way we discover a certain element of it is entertaining. We can then make a new mechanic that gets right to the heart of the fun. In Journey to Un’Goro, we knew we wanted to add Elementals, and we tried about 10 different mechanical designs. By playing with each design and discussing them, we narrowed in on the best ones. Eventually, we chose our favorite and adjusted all the Elementals to match the one we liked best. What other designs for Elementals did we try out? 1. Elementals get a bonus if you cast a spell this turn. 2. Elementals get a bonus if the last card you played was an Elemental. 3. Elementals get a bonus if the last minion you played was an Elemental. 4. Elementals get a bonus if you control another Elemental. 5. Elemental was a minion type and a spell type. 6. Gain Elemental Charges and spend them to power up Elementals. Each of these designs hit us with different problems or challenges, causing us to eventually arrive at the mechanic we shipped with. Do all the new Elementals have this new mechanic? 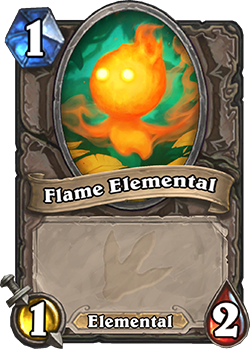 No, there are plenty of other Elementals in the set. Both of these cards can help set up big plays by giving you 1-Cost minions you can play to power up your other Elementals. 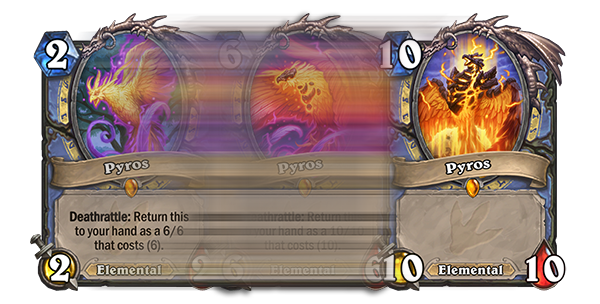 Previously, we revealed Pyros. 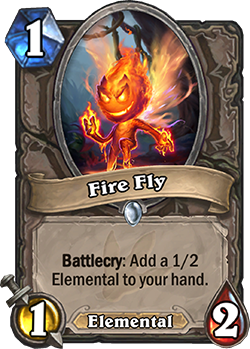 Pyros is particularly great because it can help trigger your Elementals when you play each incarnation of him. Why do we like this mechanic for Elementals? Elementals are fun because you can plan future turns in advance and get rewarded for it. You end up playing your turn differently because you’re thinking about what you want to do on your next turn …and even the turn after. 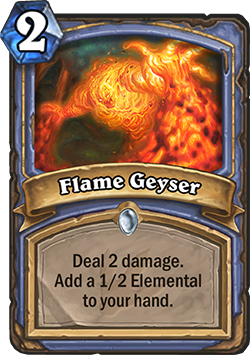 Some of the Elemental cards are particularly good in control decks. 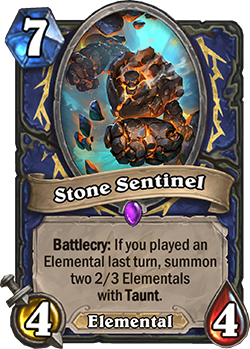 Notice how Stone Sentinel is a late game card that gives you two Taunt minions? 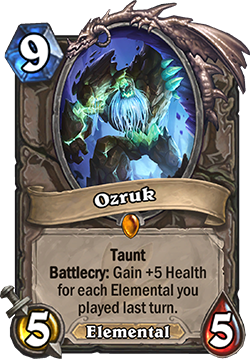 Ozruk, the new Legendary Elemental, is a huge Taunt minion when played in a deck with lots of other small Elementals. What existing cards became Elementals? When we created the Elemental minion type, we knew we would want to change some existing cards to become Elementals. We went back and looked at every Hearthstone card one by one and decided which ones to change. There are about 25 new Elementals in Un’goro. We decided to put them primarily in Shaman and Mage because those are the classes that traditionally use elemental magic and summon things like Water Elementals and Fire Elementals. However, there are a bunch of Elementals in neutral and the other classes, so everyone can dabble in Elementals if they want to. The elementals are callin’ and if you put them all in, you gon’ be ballin’.